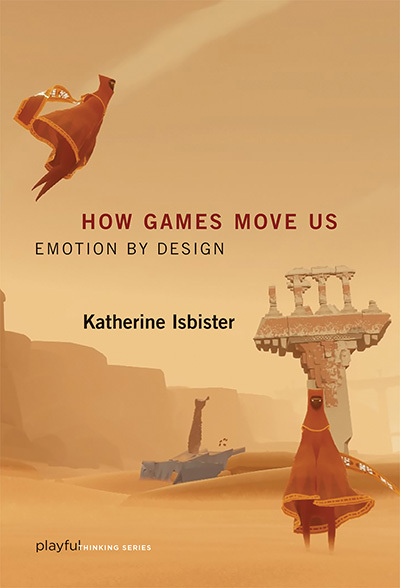 In her new book, How Games Move Us: Emotion by Design, Katherine Isbister presents a new way to think about videogames and their effects on people who play them. A professor of computational media at UC Santa Cruz, Isbister sees games as a cultural medium on a par with books, films, and music, and just as worthy of serious consideration and analysis. "We don't talk in a sophisticated manner about games the way we do about films and books," she says. "I wanted to convey what is unique about games and point out the design innovations that enable games to affect users in new and emotionally powerful ways." With the soaring popularity of videogames has come the inevitable handwringing over their effects on children and society. Some critics have argued that games are creating a generation of isolated, emotionally numb, antisocial loners. According to Isbister, however, games can actually play a powerful role in creating empathy and other strong, positive emotional experiences. In the book's introduction, she describes it as "a guided tour of exactly how games can influence emotion and social connection, with examples that unpack the experience of the gamer." Isbister draws her examples from a broad range of games, including popular "AAA" games, indie games, art games, and avant-garde projects. By exposing readers to a larger variety of game genres and experiences than they may have encountered, she hopes to expand the cultural conversation about games while giving readers the terms and tools for an informed analysis of games and game experiences. "I also hope this book will raise the esteem in which games are held as an innovative and powerful medium for doing what all media do--helping us understand ourselves and explore what it means to be human," she writes. How Games Move Us is part of the Playful Thinking book series from MIT Press.